Like the good little blogger I am, I want to share a strange occurrence from my life today. 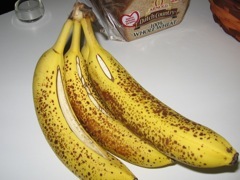 I came home from work today to find the bananas I purchased at Target (not a SuperTarget) on Sunday peeling themselves! 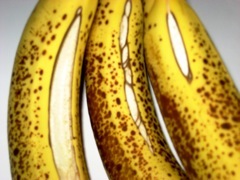 This weird testament of nature’s power must have happened recently as the insides of the bananas were not even browning yet. Marvel at the wonder that is hatching bananas! P.S. If anyone can tell me why WordPress only offers the Thumbnail option in the file browser when importing on some images, please let me know. This stupid post took me nearly an hour to finally publish because the Thumbnail option didn’t show up on my big images and I can’t find a free thumbnail creator for OS X (no, iPhoto does not cut it because it does crap for web publishing). I get the wordy but wonderful mnartists.org weekly e-newsletter, and this week was especially interesting. The top story is about Fox 9 anchor Robyne Robinson’s local art collection, including many photos of pieces as they are displayed in her home. I love looking into people’s homes, so that’s probably the real reason why this story fascinates me. But I’m also interested because Fox 9 is such a piece of crap otherwise. Can’t this girl do better? She’s smart, she loves art & culture, she’s beautiful…and she works for the lamest local news? It just doesn’t seem right. Speaking of Mpls coolness, I’m checking out Sound Unseen this weekend. I’m especially excited for the Harry Smith doco. As loyal readers may remember, I became obsessed with old timey American folk/roots music, mostly due to Smith’s Anthology of American Folk Music, last year. I think part of this film is on a DVD in my Netflix queue. Anyway, I can’t believe I’ve never been to this festival before. Films about music — HELLO!? So there’s been a lot of news lately about recalls of products made in China. A plant manager even hanged himself over it. What’s the deal? The US has a huge trade deficit with China. China is quickly becoming a global economic superpower, and wants to become #1. Many products made in China have deadly ingredients added to them, causing the recalls. Now, I may be paranoid, and I don’t mean to start another “red scare”, but isn’t this a bit suspicious? Could these be more than a coincidence, more than an accident? As per usual, I jumped the “Once” bandwagon almost too late. I heard about it a few weeks ago from an acquaintance who was telling anyone who would hear about it. I put it in the back of my mind until I saw that NPR offered a Glen Hansard and Markéta Irglová performance of the songs from the film. I was memorized. I even made a semi-impulse amazon.com purchase of the soundtrack (plus Rufus Wainwright’s latest and Miranda July’s brilliant “Me and You and Everyone We Know“). I never do that. I feel like I’m only just now getting it, like the real story of the film is just now sinking in. However, I’ll have to watch it again on DVD because either I missed some things or there are some glaring holes (Did we see her show him the lyrics she wrote? And how does she know English so well?). As anyone familiar with The Frames already knows, Glen has one of the best voices in rock today. He’s pure passion. I listened to some of their live stuff via NPR (if I weren’t a member, I’d probably begin to feel guilty by now) and sort of liked it. Then I listened to their latest album, which was even less interesting. I think my problem with it is that Glen is so passionate, even when he doesn’t need to be. It makes sense in the movie because, well, it’s a movie. I expect some melodrama. But music doesn’t need to always be super dramatic. So, add “Once” to your Netflix queues now or run and see it before Thursday at the Lagoon if you’re a fan of music, love, romance, and great stories. Apple finally came through for me. I’ve been impatiently waiting for the new iMacs for at least a year. So, Tuesday the 7th was a big day for me. I saw at least three others purchasing the new iMacs. I went to the Ridgedale Apple store right after work. I learned something interesting there — the Apple store workers find out about these big Apple announcements when they do. So, they get these shipments and can’t open any of the boxes until after the announcement. This Apple store only had like three new iMacs set up — the rest were the previous generation. So, obviously they were not prepared. Let me start out describing my experience the same way everyone else has — it’s a beautiful machine. But better yet, it matches my living room/office look. My “entertainment center” is aluminum, my TV and DVD player are silver, my computer desk and corresponding end table are both aluminum and glass, and now so is my computer. Plus, the printer I bought for $10 (after rebate, of course) is silver too. My computer is very near my TV, and it is nearly the same size. I got the 20″, but it seems bigger, probably due to the widescreen. It came with the little remote, (Front Row may prove to be just as handy as it is visually pleasing), the new anorexic keyboard and a Mighty Mouse, which would be perfect if it were just a bit shorter. 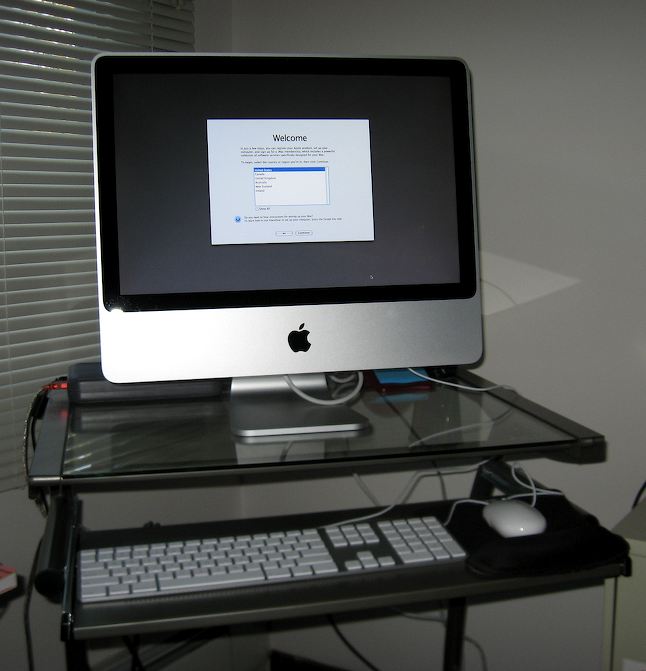 As I told a friend, I believe that a Mac is the best bang for your computer buck, mainly due to iLife. iLife and many of the other built-in features of OS X are miles ahead of anything you can get for around the same price on a Windows machine. Plus, on a Windows machine, you’re dealing with a bunch of different app creators, so everything is different. Although my anti-trust socialist head says OS X is a monopolize ecosystem for the most part, there are of course other solutions you could buy or get for free. But there’s something to be said about getting all your primary apps from the company that made your computer — reliability.